Earlier in the year, we released an electronic edition of story paper author Mrs. Alex. McVeigh Miller‘s An Old Man’s Darling through Project Gutenberg. 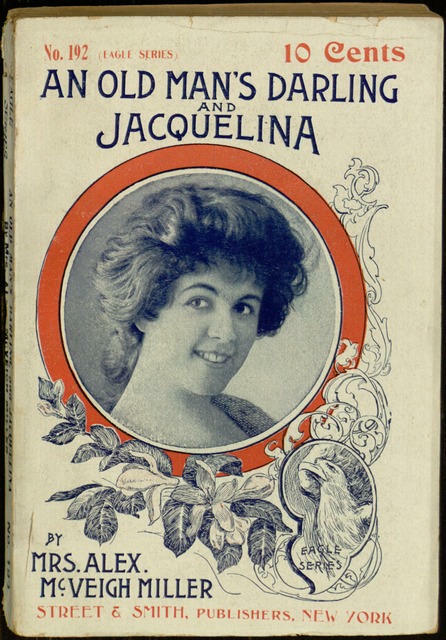 That novel was published in an omnibus volume with a second story, Jaquelina (misspelled “Jacquelina” on the cover), which will be our next Mrs. Miller release. If you would like to help prepare a clean electronic text of this 19th-century melodrama, you can participate through the Distributed Proofreaders project. To learn more about the proofreading process, see this earlier blog post; to dive into the work, visit the project page.